If you are in the market for an over-the-counter antacid, you are in luck. There are certainly plenty to choose from and the drug companies, who are making these products, are really raking it in. Truth be told… most people who reach for antacids don’t really need them. The digestive process starts even before you take a bite, it actually starts when you think about and smell food. The brain says, food is on the way and it sends out signals to prepare the body for digestion. These signals start the release of gastric juices and hydrochloric or stomach acids. All of this happens in anticipation of food. Nothing has been eaten yet. Lets say, for example that you eat a meal that contains proteins, carbohydrates and fats. The first step to digestion is the most critical – chewing. Your teeth are actually part of your digestive system and are responsible for breaking down the food into small pieces. The food travels down the esophagus where it bumps up against the LES (lower esophageal sphincter). This is the bridge between the esophagus and the highly acid stomach. The LES valve is what keeps stomach acid from going back up the esophagus. Food travels into the stomach and the stomach produces the hydrochloric acid which stimulates the production of an enzyme known as pepsin. Pepsin is necessary for the breakdown of protein. It takes about 2 hours for most meals to be completely transformed into a soupy substance known as chyme. At this point in digestion, the substance is slowly released into the small intestine where nutrients are absorbed from the food. Two very important things happen in the small intestine. First bile is released to help emulsify or break down the fats so that they can be easily digested. Second, the pancreas produces digestive enzymes, to be used to break down what we ate. The liver, gallbladder and pancreas are all instrumental in the proper breakdown and digestion of food particles. The liver, gallbladder and pancreas have an on off switch that is initiated by the acidity of the chyme coming in from the stomach. If there is not enough acidity in the chyme the switch to signal this highly important part of digestion to take place never happens. It helps to think of it as a domino effect – whatever happens above in the stomach indicates what will happen below in the intestines. If what is upstairs is not working – what is below won’t work right either. 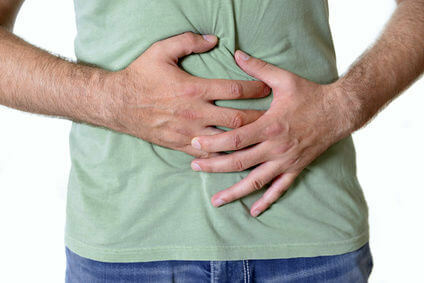 Fact: 90% of the time heartburn is caused by too little stomach acid, not too much. Not having enough stomach acid (hypochlorhydria) is instrumental to digestive health. A normal stomach that makes enough acid has a pH between 1 and 3. In a stomach that does not make enough acid the pH is between 4 and 7. If you don’t have enough hydrochloric acid you cannot initiate the production of pepsin, which is necessary to break down proteins properly. Proteins break down into amino acids and peptides. If you suffer from insomnia, depression, brain fog or are having a hard time building muscle it may be caused by a lack of amino acids that lead to neurotransmitter problems. If you want to put on muscles you need proteins to break down properly. If the chyme coming out of the stomach is not acidic enough the liver and gallbladder do not function properly, which means the bile cannot break down fats and the pancreas malfunctions. This leads to fatty acid deficiencies, such as omega 6, and problems with the fat soluble vitamins A, D, E, and K.
Sufficient stomach acids also protects you from dangerous bacteria and parasites that are found on and in food. When stomach acid is at the normal pH , most parasites and bacteria can’t survive for more than 15 minutes. However when you have too little stomach acid, and your pH is high, parasites and bacteria pass through the stomach and set up shop in your body, which can lead to heartburn. The bacteria that are coming in through your food and drink feed off carbohydrates. Without enough stomach acid you also do not have enough amylase and other enzymes needed to break down carbohydrates. The bacteria, now present in your stomach, feed happily on all of the unbroken pieces of carbohydrates. As this happens you become bloated and gassy which pushes back through the stomach and opens the LES valve and allows the acid to enter the esophagus causing heartburn. Remember – you are only treating a symptom when you use antacids and other over-the-counter aids – these drugs can, in the end, only worsen your symptoms. There are several things you can do to naturally increase the amount of acid in your stomach and improve overall digestive health and gain internal balance. Apple cider vinegar – 2 tablespoons with 6 ounces of water before meals. Lemon and lime juice – 2 tablespoons with 6 ounces of water before meals. Swedish bitters – take 15 minutes before meals helps initiate hydrochloric acid. Water – something so easy as drinking more water can actually help to raise stomach pH – drink a large glass of water prior to each meal to help increase acid. Hydrochloric acid supplement – taking a betaine hydrochloric supplement, which can be found at most health food stores can help your body better digest food. Change your diet – eating processed foods only exacerbates problems with digestion and gives plenty of energy to unhealthy bacteria. Choose fresh, organic fruits and vegetables as well as healthy fats and protein. Use Himalayan salt – using unprocessed salt, such as the pink Himalayan variety, will provide your body with chloride, which it needs to make hydrochloric acid and also contains over 80 trace minerals that the body needs to perform optimally. Drink cabbage or sauerkraut juice – these juices stimulate the production of acid. Drink just a few tablespoons before eating. Fermented foods are generally quite good for you. If you cannot find or do not like fermented foods – take a high quality probiotic. Final note: Be sure to get tested for H. pylori. This is a bacterial infection that 50% of people have. It attacks stomach cells that produce stomach acid and can lead to very dangerous health problems. Note: Always talk to your physician first before attempting any natural solutions. Hey Buddy!, I found this information for you: "8 Foods that Stop Heartburn". Here is the website link: https://www.thealternativedaily.com/war-wtih-stomach-acid/. Thank you.